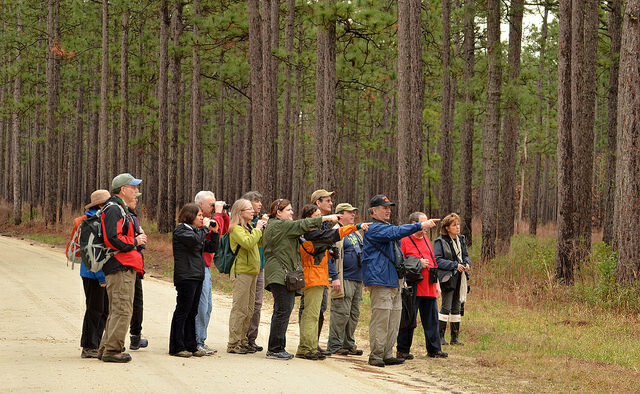 New Hope Audubon Society (NHAS) is the chapter of the National Audubon Society that serves Chatham, Durham, and Orange counties in central North Carolina–including Carrboro, Chapel Hill, Durham, Hillsborough, and Pittsboro. The mission of the New Hope Audubon Society is to promote the conservation and enjoyment of birds, other wildlife, and ecosystems, focusing on Chatham, Durham, and Orange counties. Our membership meetings are held in the Visitor Education Center at the North Carolina Botanical Garden, 100 Old Mason Farm Road, Chapel Hill, on the first Thursday of every month (except June, July, and August). Everyone, including non-members, is welcome! See you at a meeting soon! New Hope Audubon Society (NHAS) is governed by a board of directors with duties outlined in the chapter by-laws. Officers are elected at the May membership meeting and serve through the following April. Committee and special project people are appointed by the board–volunteers are always welcome! Below is a list of current officers and committee chairs. If you would like to download our New Hope Audubon Society full-color brochure please click here. In 2011, New Hope Audubon Society updated and amended its Constitution and By-Laws. Click here for a PDF version of these documents.